"When pigs fly" is a way of saying that something will never happen. Such as when will I ever eat liver? When pigs fly. When will I ever root for the Patriots? When pigs fly. You get the idea. 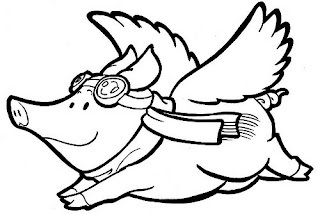 Is there any situation when you can say, "When pigs fly" with God? Sure there are. God will never say WOW! God is all-knowing. You cannot do anything that will make Him say, "Wow, I didn't see that coming." Or, "Oops, I guess I shouldn't have done that." God will never give up on you! God will always be in your corner. Even when you don't deserve it, He will never, ever give up on you. As the old song says, "He's as close as the mention of His name." God will never think anything less than His best intentions for you. God is good, and that means He wants to do great things in your life. The key to receiving His blessing is to follow Him. P.S. In the aftermath of Hurricane Irma we have learned that the Keys are in serious need of canned meats and veggies. No power, no grocery stores and they are running out of food. Also, they can use whatever camping supplies. Many homes have been condemned leaving people sleeping in their front yards. If you would like to donate locally, you can bring your donation to the church. If you do not live locally, please give to Convoy of Hope. They are addressing the need also, but they need your help.